Keep everything you need for golf in one place with the Suncast GO3216 Golf Organizer. With this golf organizer, you’ll never fumble around the house last minute for your shoes, hats, gloves, and extra balls ever again. Being organized also helps you make it to the golf course early enough to warm up that perfect drive before your tee time. The Suncast GO3216 Golf Organizer lets you organize all your golfing necessities in one place. The Suncast you’ve got a one-stop shop in your own home where you can keep your golf bag, golf shoes, golf gloves, etc. I know I’m usually running out the door, making multiple trips to bring my bag, shoes and whatever else I need that day for the course. The Suncast is constructed of tubular metal, which has more than adequate strength for holding all your golfing necessities, with the added benefit of being light-weight- making reorganizing a snap when the time comes. The interior of the Suncast has a protective strip that serves two purposes. One- it limits wear and tear putting your gear on and taking it off the unit. Two- the protective strip actually helps hold your equipment in place, so there won’t be any unexpected falls or drops. The mesh lining for the side compartments and the rear of the unit also serves the purpose of keeping your various items in place. The plastic foot pegs are easily adjustable to compensate for uneven surfaces. The exact dimensions of the Suncast are 32 x 16 x 37- So that’s about 3 feet tall, by 3 feet wide and a foot and a half deep. It’s designed to hold two golf bags. The side shelves are perfect for keeping all or at least most of your golfing accessories- stuff like balls, tees, spikes, gloves, shoes, etc. The top side shelf looks and functions more like a tray for smaller odds and ends. 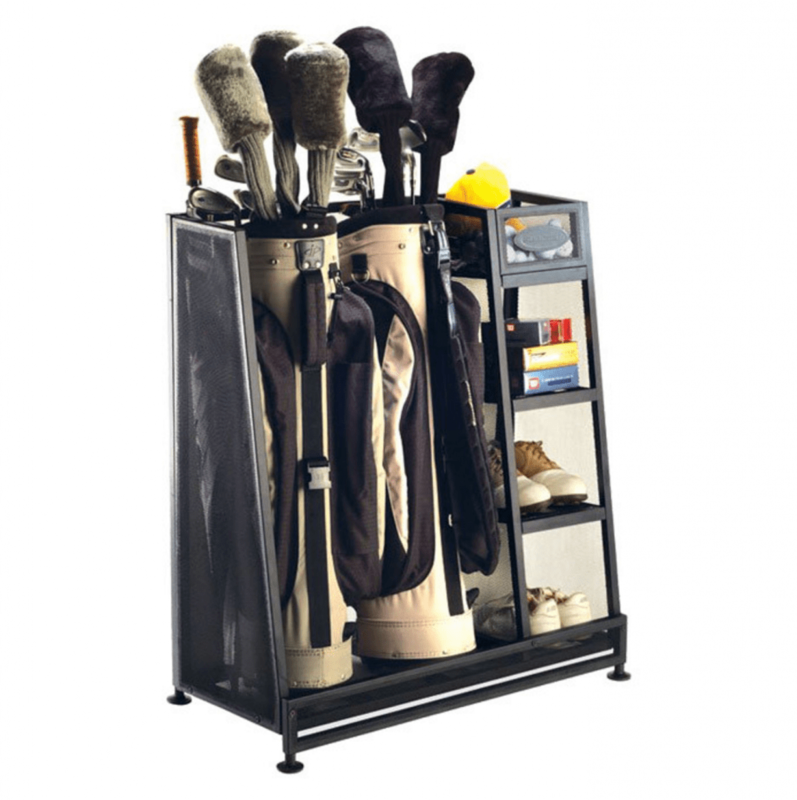 The Suncast GO3216 golf organizer can house your entire golfing tool set in one convenient location. It’s light weight, well constructed, and is handsome too. I think you will be happy with this very reasonably priced purchase. AAAnd, if you want a set of nice clubs to stick in that rack, be sure to read up on the 2016 Ben Hogan FT Worth irons, here.